PTT control using serial port control lines or parallel port data lines. Rig control using hamlib. This can be used to show real frequencies in waterfall or to control PTT. Fixtext macros can include variables and output from any Unix command. gMFSK uses the computer soundcard to interface to a SSB capable transceiver. All digital signal processing is done in the main CPU so any soundcard supported by the operating system should work. gMFSK is built on Gnome libraries but it doesn't require you to run the Gnome desktop. Most modern Linux distributions install Gnome libraries independent of what desktop you choose to run. You will also need the FFTW 2.x libraries to run gMFSK. Rig control naturally requires hamlib. 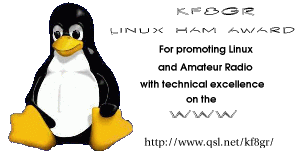 gMFSK is distributed under the terms of the GNU General Public Licence, version 2.